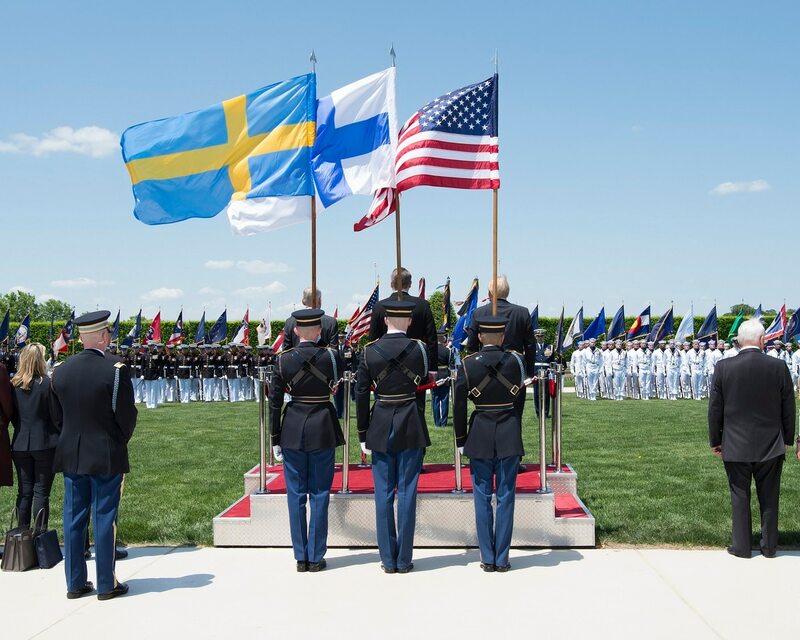 WASHINGTON ― Finland, Sweden and the U.S. have signed a new letter pledging to increase the national security relationship between the two nations. The language in the agreement, signed Tuesday at the Pentagon by U.S. Secretary of Defense Jim Mattis, Swedish Minister of Defence Peter Hultqvist and Finnish Minister of Defence Jussi Niinistö, is nonbinding and largely involves big themes as opposed to steady deliverables. But speaking to Defense News after the signing, both visiting ministers emphasized that this is a starting point for future strengthened relations, and that there will be a particular emphasis on increasing and planning joint exercises. Niinistö called the potential for greater coordination and increased exercises the “most concrete and important part” of the letter, adding that the discussions will have an impact as Finland prepares to host a major exercise with its partners in 2021. Click here to read the trilateral statement. The three nations had previously relied on a series of bilateral agreements tying each other together in loose ways. But the aggressiveness of Russia following the 2014 invasion of Ukraine has driven Sweden and Finland to look to create more formal ties with the U.S.
“When we speak together like this, we bring a tempering of anyone’s aggressive desires, and I think that is the message here today,” Mattis added. Among the points called for in the letter are regular trilateral meetings at all levels, including study groups; exchanges of information at all levels; increased “practical cooperation” between the three militaries, including coordinated participation in training and exercises; greater cooperation in multinational operations; and coordination of strategic communications between the countries. The letter also calls for the three to help drive an “enhancement of the EU-NATO strategic partnership,” a notable line given recent tensions between the European Unoin and NATO member nations around defense issues. Finland and Sweden are nonaligned countries with NATO, which Washington sees as the core of its European defense interests. The two nations are active members of the EU and its newly founded Permanent Structured Cooperation on Security and Defence, or PESCO, agreement, which American officials have been wary of, in part over fears it could lead to protectionism for European’s defense industry. But the minister said Finland and the U.S. are aligned in their goal to avoid any sort of protectionist bent for European industry from the agreement, as Finland is “practically married” to U.S. defense technology.